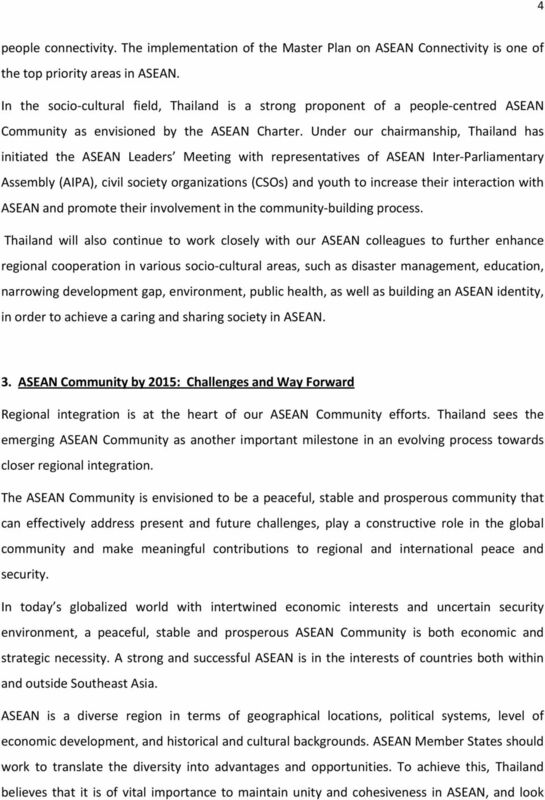 Download "Thailand and ASEAN. 1. ASEAN: Forty Five Years of Achievements"
1 Thailand and ASEAN 1. ASEAN: Forty Five Years of Achievements Since its inception in 1967, the Association of Southeast Asian Nations (ASEAN) has made a number of achievements towards regional peace, stability, and prosperity. Thailand has played an active role in ASEAN from the very beginning. Thailand is one of the founding members of ASEAN, together with Indonesia, Malaysia, the Philippines and Singapore. The ASEAN Declaration, or Bangkok Declaration, was signed on 8 August 1967 at Saranrom Palace, Bangkok. As stipulated in the Bangkok Declaration, ASEAN was established with an aim to promote peace and stability, and accelerate economic growth, social progress and cultural development in the region through joint endeavours in a spirit of equality and partnership. Over the years, ASEAN has gradually evolved and expanded to include Brunei Darussalam (1984), Viet Nam (1995), Lao PDR and Myanmar (1997), and Cambodia (1999). From a loose association in 1967, ASEAN has transformed into a rules based regional organization with the entry into force of the ASEAN Charter in 2008 and earned world wide recognition as a dynamic regional grouping. The peace and stability that the Southeast Asian countries have been enjoying today to a large extent, largely due to ASEAN's role as a forum that promotes and fosters trust and confidence amongst its Member States. ASEAN has successfully maintained peace, stability and security in the region through the various frameworks and mechanisms, such as Zone of Peace, Freedom and Neutrality (ZOPFAN) (1971), Treaty of Amity and Cooperation in Southeast Asia (TAC) (1976), and Southeast Asian Nuclear Weapon Free Zone Treaty (SEANWFZ) (1995). To further enhance regional cooperation in political and security issues, the ASEAN Regional Forum (ARF) was established in 1994, which now comprises 27 participating countries including all major regional players. The ARF who serves as a forum for constructive dialogue and consultation to promote confidence building and preventive diplomacy in the region. 2 2 On the economic front, ASEAN has made an important milestone in regional economic integration with the conclusion of ASEAN Free Trade Area (AFTA) Agreement in Since then, ASEAN has continuously pursued closer economic cooperation in trade, services and investment, and moved towards a single market and production base to increase the regional competitiveness. Furthermore, ASEAN Leaders have agreed to start negotiating on the RCEP (Regional Comprehensive Economic Partnership) which will encompass 6 Dialogue Partners, i.e. China, Japan, Republic of Korea, India, Australia and New Zealand. ASEAN has also enjoyed functional cooperation in many areas, such as education, disaster management, health, environment, rural development, and science and technology (S&T), to name just a few. Such cooperation has helped increase regional resilience and enabled us to respond effectively to challenges such as pandemics (SARS), natural disasters (2004 tsunami and 2008 Cyclone Nargis), and other transboundary challenges such as haze and drugs. 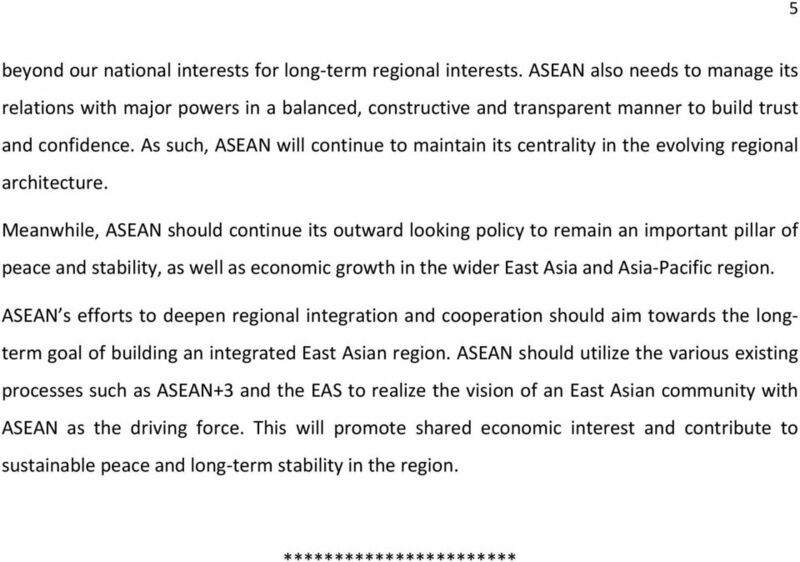 With regard to external relations, ASEAN has cultivated close cooperation in numerous fields in the frameworks of ASEAN+1 (with its 10 dialogue partners, i.e. Australia, Canada, China, India, Japan, Republic of Korea, New Zealand, Russia, United States, and European Union), ASEAN+3 and the East Asia Summit (EAS). With the participation of Russia and the United States in 2011, the EAS now includes a number of key global players. Three out of five Permanent Members of the UNSC and eight members of the G20 are now part of the EAS. 2. Thailand s Contribution to ASEAN ASEAN has been and will continue to be a cornerstone of Thailand s foreign policy. Thailand attaches great importance to enhancing cooperation within ASEAN frameworks to build trust and confidence among ASEAN Member States, as well as to promote peace, stability and prosperity in the region. Thailand s contribution to ASEAN has been continuous and active. Under our chairmanship in , the ASEAN Charter entered into force and transformed ASEAN into a truly rulesbased organization. Thailand is thus fully committed to the effective implementation of the ASEAN Charter, which is vital to the ASEAN community building process. I congratulate you on your election to preside over the 65th Session of the United Nations General Assembly. Legislative Process and Governance Professional Fellowship Frequently Asked Questions for International Fellows Revised October 2016 This program is managed through the support of a grant from the U.S.